Representatives from more than 30 college and K-12 farms gathered at Stonehill College today to connect, share stories, and tackle common challenges faced by campus farms in New England. This campus-focused event was the first of its kind, co-hosted by The Farm at Stonehill College and Farm to Institution New England (FINE). Campus farmers who attended the summit learned from each other and from individuals working for local nonprofits and small businesses about the different ways to cultivate successful living classrooms and help fuel social change. Students, faculty and community partners will gained knowledge about the different opportunities available to engage with the fields of food justice, food security, the real food movement, sustainability, nutrition, research, and academic excellence. The day opened with a panel discussion on the many faces of New England campus farms – they serve as living classrooms, producers for campus consumption, and as hubs that promote social justice. Attendees then split for eight in-depth workshop sessions covering themes such as innovation and entrepreneurship, professional development, campus food insecurity, and farms as catalysts for campus change. And the day closed with a discussion led by Dr. Deirde Tobias of the Harvard T.H. Chan School of Public Health regarding campus farms as spaces that foster social change. Campus farms and gardens offer important learning opportunities for students and neighboring communities. 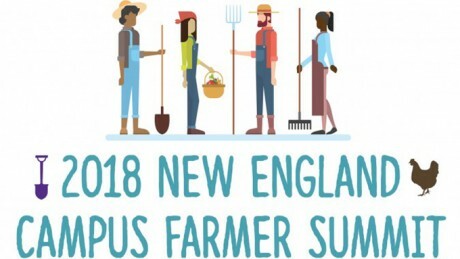 For years, campus farmers have created their own learning spaces by networking online or at workshops at conferences like the 2017 New England Farm to Institution Summit. This fall, fueled by the energy among campus farmers to meet and share their farms’ stories, The Farm at Stonehill secured a grant from the Vela Foundation and partnered with FINE to host this year’s inaugural New England Campus Farmer Summit. The Farm at Stonehill was established in January, 2011, in response to food access issues in the neighboring city of Brockton, Massachusetts. Since its inception, The Farm has donated over 60,000 pounds of fresh organic produce to our four community partner organizations. Through four community partners and Mobile Market, their produce reaches the table of about 3,000 individuals or families each season who may not otherwise have access to fresh, organic produce due to a number of social, economic, and geographical barriers. Farm to Institution New England (FINE) is a six-state network of nonprofit, public and private entities working together to transform our food system by increasing the amount of good, local food served in our region’s schools, hospitals, colleges and other institutions. FINE’s mission is to mobilize the power of New England institutions to transform our food system.The FINE network consists of non-profit organizations, government agencies, institutions, foundations, farms, food distributors, food processors, food service operators and others. For more information, visit www.farmtoinstitution.org.